In our last blog, we discovered several ways you can make your carpet last longer. However, there are many different options you can consider. 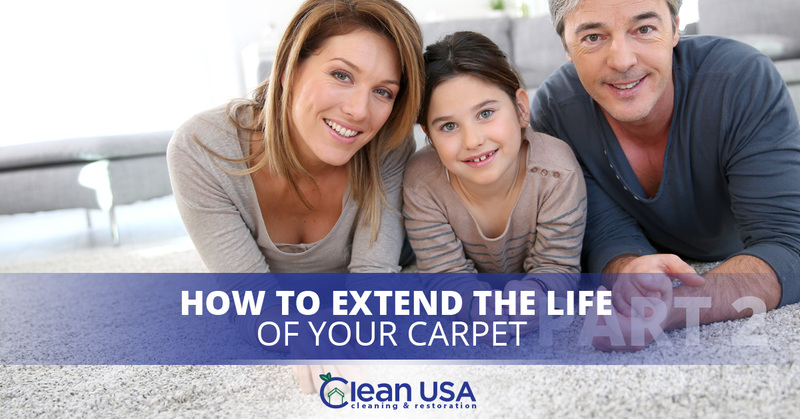 At Clean USA, we are excited to share some more strategies you can employ to keep your carpet beautiful. The way carpet is designed makes it very absorbent. Whether it’s liquid or sediment, the longer it sits on your carpet, the deeper it will go. If there’s a spill or a mess, don’t put off cleaning it up. Instead, follow these two basic steps: remove any solids and then dilute any of the remaining material. Instead of scooping solids, use a knife to scrape them onto a paper towel. After the solids are gone, wet the area and put a towel over the top of it so that the material can absorb into the towel. You may have to repeat this process several times. If this isn’t effective, mix equal parts white vinegar and water to break the stain up more. Resist the urge to scrub at the stain. Pressure only pushes the stain deeper and forces it to spread out. Focus on blotting and lift the stain out of the carpet. It can also be a good idea to start blotting around the stain first to prevent it from spreading. Prevent dirt from getting into your home in the first place. A doormat is your very best friend when it comes to trapping contaminants outside your door. Put doormats in front of all your doors and make sure they have enough texture to clean dirt off. You’ll need to lift the rug and knock dirt out regularly. Keep an eye on the mat so you know when it’s worn out and in need of replacement. You can also make a habit of removing your shoes once you get in the door, which will keep your carpets even cleaner. Removing your shoes is especially important if you’ve been working in the garden or doing home repair. Take your pets into consideration. Having pets can make life far richer, but they bring their own brands of wear and tear to your carpeting. If the animal is young and untrained or getting old and having difficulty with control, you can end up with urine and other smelly substances in your carpet. Additionally, the length of your animal’s fur makes a difference. Animals with long fur will collect and spread more dirt, allergens, and debris into your carpet. The same goes for outdoor animals. Figure out how to work with your animal and care for your carpet to keep it looking its best. Your carpet should be treated with hot water extraction at least once a year. Depending on wear and tear, you may want to have the carpet cleaned every six months. It should be professionally done to ensure that the cleaning penetrates to the base of the carpet and removes allergens, deep dust, greasy residue, and other contaminants. It can be tempting to use a portable machine yourself, but those smaller machines don’t have the power to clean anything more than superficial dirt. We are proud to offer Sycamore world-class carpet cleaning that leaves carpets looking great. Best of all, our services will help your carpets last longer. Contact our home carpet cleaners today!